YIN YOGA: Shine Your Light in Naples! Yin Yoga is opposite of Yang Yoga. It is not a workout. It is not exercise. It will not enhance your ego. Yin Yoga (or Taoist Yoga) is nature-based, organic and easy, yet very deep and transformational. Yin yoga is not for the workout, but for the work of yoga, which is to discover your habitual and limiting patterns and to set your Self free. Throughout our Yin Yoga practice of self-realization, we will embrace all 8 Limbs (ashtanga) of yoga: Yama (5 promises to the world), Niyama (5 promises to yourself), Asana (bodily movement and poses), Pranayama (fueling breath), Pratyahara (falling into introspection/insight), Dharana (quiet concentration), Dhyana (receptive contemplation) and Samadhi (surrender to bliss). Yin Yoga penetrates all 5 realms of being (koshas): physically cleansing and remodeling, energetically calming and clearing, mentally quieting and clarifying, psychologically unifying, and spiritually enhancing connection to Source. Physically, we will access and release connective tissue through the asanas. We will proceed through the 7 chakras (energetic vortices) to cleanse and release long-held knots (granthis) and impediments. Energetically, our realignment will open and channel the life force (prana), expanding the electromagnetic current throughout the meridians (nadis) and creating the “diamond body” (vajra deha). Mentally and Emotionally, with focused breathing, the mind is stilled and clarified, erasing negativity and doubt, depression and anxiety, preparing the way for visionary accomplishment. Spiritually, the coursing of prana awakens the impetus to expand (kundalini shakti), shine, and to feel your oneness with Oneness. Yes… Yin will give you greater range of motion in your joints, expanded elasticity in your connective tissue, enhanced mental acuity and intuition. Yin Yoga will even give you confidence and peace of mind. But, even greater still, Yin Yoga will turn you on. Quantum physics holds that your body is a liquid crystal matrix, simply a receiver of vibrational input and a conductor of the expression of you– your own unique and particular frequency. Your job, as a yogi, is to tune in. Tune your instrument. Attune, and get out of your own way. Broadcast your unique radiant, gift to the world. When we are attuned to our own highest frequency, we spread that light. One breath, one soul at a time, we can illuminate the way (Tao) before us. Please join us! or online with the MINDBODY app. 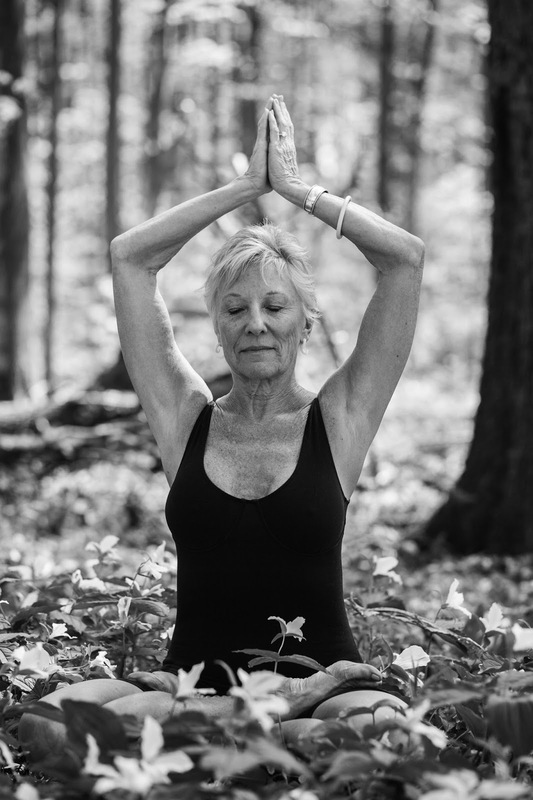 Sandra Carden, ERYT, has studied and taught yoga and yoga philosophy for almost 50 years. YoFlo - Juicing Up Your Connective Tissue! Fascia is the new buzzword in all realms of bodywork and somatic practices, including yoga. What is fascia, or connective tissue? Why is it important to know the role connective tissue plays in overall health and vitality? Where we once described fascia as the thin wrapping around muscles, we now know, through modern high-powered magnification, that fascia wraps around and through muscles, bones, organs, lymph, blood, and water. Fascia runs deep, down to the cellular and subcellular levels. Fascia determines our shape. Fascia holds us together. Fascia connects everything to everything. Fascia, in yoga parlance, is the superhighway of life’s energy, instantly responsive, transmitting the very essence of life itself- prana. Where there is a knot or impediment in flow, there is a disturbance in the transmission of prana, or life-force. Your myofascial meridians are the “trains” or pathways of ever-changing, vibrating, pulsing liquid crystal continuity throughout the body (and the universe, for that matter). 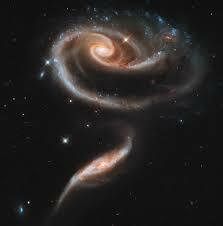 Everything is connected to everything, down even beyond the cellular level and out beyond the edges of the universe. We are part of a universal living matrix. Your own body, your ever-responding Living Matrix is your home. It defines you and you live and breathe. It keeps you together. It gives you head-to-toe longitudinal awareness of where you are in space – proprioception ­– where YOU ARE NOW. Here. And ‘here’ is continually in flux. These lines of transegrity (Buckminster Fuller’s name for this web of life force) “pull” along muscle delineation as a result of load-bearing, resulting in extension of the strain and a counter-rebound, providing elasticity and stability to the human life-unit. All movement affects the anatomy trains and what you have been doing (or not) invariably shows up in your body. Yoga can affect the anatomy trains on purpose, to strengthen, stabilize, realign, energize, feed and cleanse the tissues, both soft and firm. Please join Sandra Carden of UNION/YOGA for YoFlo, a yoga practice stemming from an understanding of Anatomy Trains, and the magnitude of influence this may have on your yoga practice. We will incorporate awareness of fascial lines into a practice designed to enhance the flow of electro-magnetic energy, increasing range of motion, vitality, breath and relaxation. 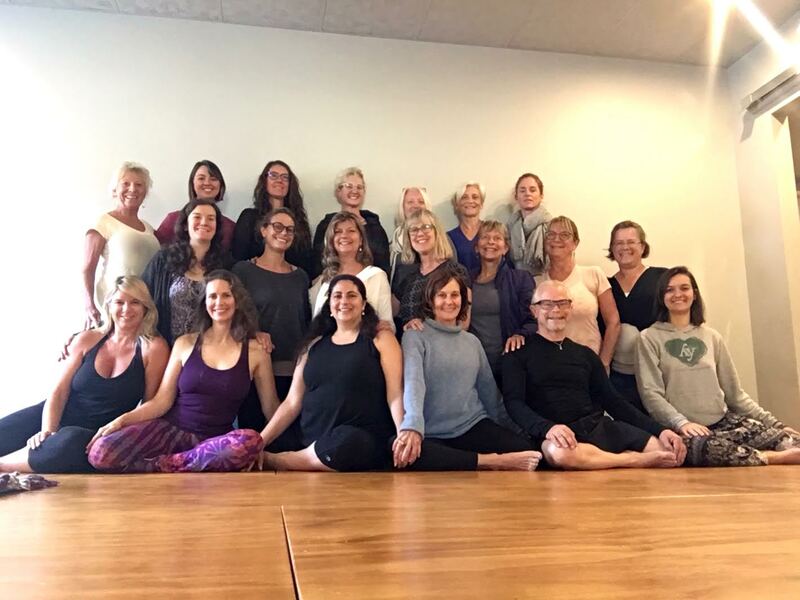 Saturday morning, January 19, 2019, from 10 AM until 1:00 PM at Yoga4 in Lake Leelanau. Please bring your yoga mat, 2 yoga blocks, 2 yoga blankets, and a strap and a curious mind. This workshop is suitable for both teachers and students of yoga. 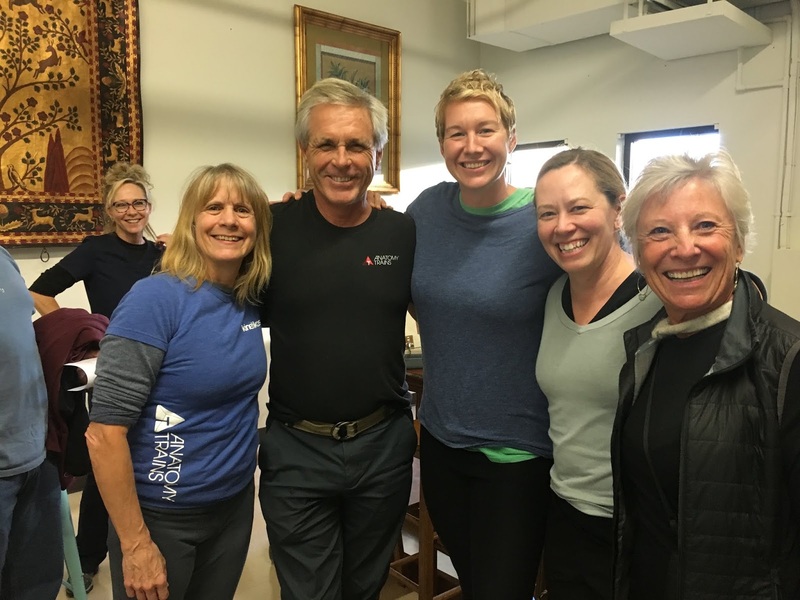 Three CEUs are awarded to Yoga Alliance registered teachers. Osteoporosis is the silent and often painless gradual loss of bone, affecting both men and women. This systemic skeletal disease, characterized by low bone mass, deterioration of bone tissue, and increase in bone fractures is not an aspect of the normal aging process. Many factors play into bone loss, and each case is unique. Please join Sandra Carden of UNION/YOGA for this in-depth Strong Bones Workshop. You will learn the causes of osteoporosis and evaluate your own risk. We will investigate symptoms, diagnosis, environmental factors, diet and nutrition, hormonal influence, habits and lifestyle. We will practice a safe sequence of yoga asanas, implementing small weights. Please join me for Osteo Yoga on Saturday morning, January 12, 2019, from 10:30 AM until 1:30 PM at Yoga4 in Lake Leelanau. Please bring your yoga mat, 2 yoga blocks, 2 yoga blankets, a strap, light ankle and hand weights and lots of enthusiasm! Yoga nidra means “yogic sleep.” This is profound meditation in a deeply relaxed state of being, resembling dreamless sleep. Yoga nidra evolved out of Tantrism, originally called nyasa, meaning “casting or placing.” We incrementally lay our conscious awareness at each level of being, from physical to soul level. Because of this multidimensional approach, yoga nidra is unsurpassed as a means toward deep physical release, emotional balance and psychological well-being. There are many variations of Yoga nidra. Typically, we will use a sankalpa, or personal affirmation at the beginning, to affirm your soul’s deepest intention. Then, a placement of awareness throughout the body, to ground you in the physical plane. We follow with a release to the subconscious through simple backward counting. Then, we experience opposing psychological states or “pairs of opposites,” reminding your body of the mind’s influence over it. We end with a guided meditation through various suggested images, enhancing the luminous, equinimical, witness-quality of higher mind, or atman. Please join me for restorative yoga poses of deep relaxation, followed by Yoga Nidra on Saturday morning, January 5, 2019, from 10:30 AM until 1:30 at Yoga4, Lake Leelanau, MI. Please dress in loose, comfortable, clothing. Bring your own mat and any yoga props you prefer. 3 CEUs each workshop granted for Yoga Alliance registered yoga instructors. Anatomy Trains, by Thomas W. Myers, has served as my entry-level understanding of the role of connective tissue as the supportive and morphic matrix composing the entire human body. I have recently been fortunate to deepen my awareness of this beautiful, intricate complex in a two-day human dissection live course with Myers at the Boulder Institute for Anatomical Enlightenment. This was a profoundly moving and, yes, enlightening experience. I bow to those who graciously donated their bodies so that we somanauts could better understand a bit more of the mystery of human life. 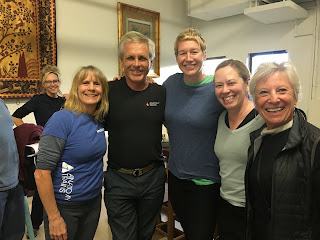 Tom Myers defines fascia, or connective tissue as the "biomechanical autoregulation system," or BARS. Tom studied tensegrity design with Buckminster Fuller. The same architectural principals of the geodesic dome apply to the human system. Tom writes in Anatomy Trains, "It appears that cells assemble and stabilize themselves via tensional signaling, that they communicate with and move through the local surroundings...and that the musculo-fascial-skeletal system, as a whole, functions as a tensegrity." Everything is connected to everything else. When one cell is pressed upon, all others align to react, respond, adapt and support the tension. We grow in the shape we are leaning into. Tom's take on whether this matrix is "conscious," or simply a neuro-muscular transmission is yet to be determined. I, myself, tend to lean toward an acknowledgment of a vast intelligence, of some unknown Source, working through humankind on a cellular and subcellular level. But, hey, that's just me. "Anatomy Trains" are the streamings of connective tissue and energetic sparking (think nadis or meridians) that criss-cross and span the entire body from skin and bones, organs and into the seas of intracellular fluids. Anatomy Trains allow, through this inner-spatial relationship, for communication of ALIVENESS. Conscious, controlled movement, creating an "even tone across the myofascial meridians," results in optimal cellular health and overall well-being. Yoga does this brilliantly. Through Yin Yoga, we go beyond mere "stretching," to a level of increased awareness, washing free of old patterns, and a fresh new reshaping of vital tissues. your own unique matrix of life–your connective tissue. Your $75 tuition entitles somatic practitioners to 5 CEU credits. as well as your yoga practice supplies. I look forward to our time of inner discovery. As a practicing yogini for almost 50 years, I continue to take classes from others. Most recently I’ve attended some of the worst classes I’ve ever encountered. Many “yoga” classes are not yoga– they are exercise (see my last article posted 3/8/18 @ www.unionyoga.com). As yoga instruction becomes more focused on asana, we are losing the essence of what separates yoga from exercise, and the supreme promise of this path. For remember, dear ones, the purpose of yoga is enlightenment. The popular tendency to race ahead willy-nilly, grasping for the pay-off of a great physical workout before we’ve invested in the gold coins of foundation will bring you nothing that lasts. There is no lasting benefit in a yoga workout. If you actually want to receive the true promise of yoga, build your foundation first. If you just want the side effect, the vajra-deha, or diamond body, carry on. Perhaps it won’t hurt you. Freedom. Liberation. Bliss. No suffering– no pain. That’s It. That is the promise of yoga. Building toward bliss doesn’t come from barging in with the body. In fact, asana alone, without foundational practice can be harmful both physically psychologically. Asana, or posture, is not the first of the Eight Limbs of Yoga regarded and revered for millenea. Before asana can be practiced, we must truly know, understand and practice the primary tenants of yoga. These are remembered as non-harming, truthfulness, open-handedness, moderation, non-possession, purity, contentment, self-discipline, self-study and surrender to a greater power. You and I may never master this framework, but we must align ourselves in accord with yogic principals before we can reap the full harvest of yoga, or else. Or else we get nothing that lasts, nothing real. The promise of yoga is ease in living. What could be more worthy of our attention? The longer this trend toward slicing up the yogic pie and greedily taking only the tasty piece of asana is perpetuated, the more we starve our souls and the farther we get from the four promises (purusartha)of yoga. These four purusartha are both the goal and the gift, the full meal and the dessert. The first is dharma/to fulfill your destiny. The second is artha/to be truly rich. The third is kama/to take great pleasure. The fourth is moksha/to be free of suffering, liberated, self-realized and blissed. Dharma plays out most prominently in the early years of life. You find what you are good at and you discover what you love. You get your education and prepare to do your life’s work. Artha is wealth. In young adulthood you establish your career or work in life, be it small and close to home or big and global- no difference. When you are doing your right work, the right amount of money will come. You buy your house and your toys and raise your family. Yoga says this wealth in life is your goal and your birthright. Kama is pleasure. Toward the middle years of your life, you need less, and the joy grows. Things are simpler and more spacious. You have the pleasure of enjoying all you have worked for. Your investment in family and finances pays off. Moksha is freedom and bliss. Toward the last quarter of your life, attention turns toward the spiritual in preparation for making the transition out of the body with ease. Relationships to others, Self and Source are fulfilling. The later years in life are sweet. They are the golden years of getting ready to go. Whether you are just starting a yoga engagement with yourself, or have been on the yogic path for many moons, reconsider what you really want in this lifetime. Slow down and ponder why the Eight Limbs of non-harming, truthfulness, open-handedness, moderation, non-possession, purity, contentment, self-discipline, self-study and surrender are called for first. Do you want to be toned and attractive, or do you want to be free? You can be both. Otherwise, it’s just an ego game. 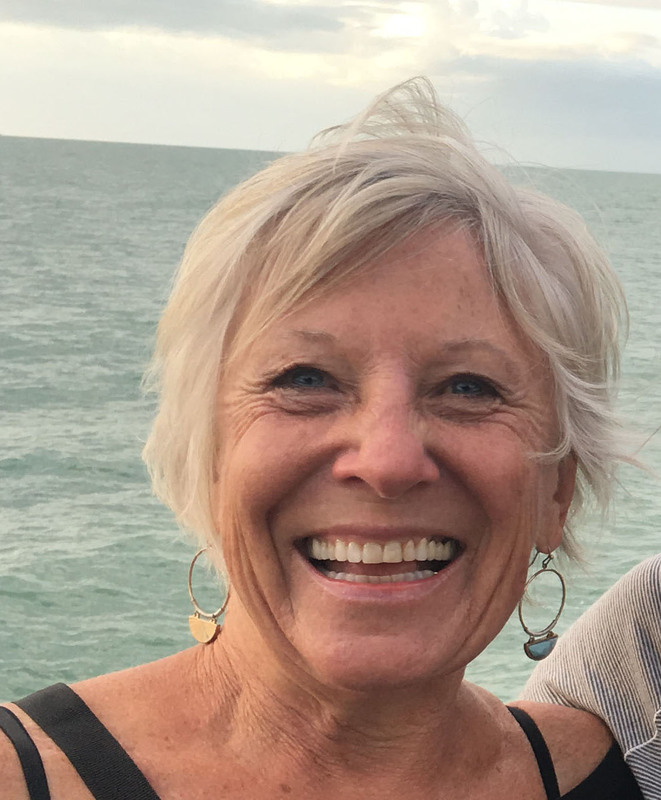 Sandra Carden no longer has a daily studio location, as she currently teaches Yoga Teacher Training Certifications and workshops only from regional venues.